Loopback testing is used to isolate a problem to a certain section/device in a network. The wire for the signal going out is looped back to the wire for the signal coming in so that it creates a loop. This sort of simulates "everything else" and can help to prove that a certain section of the network or device is/isn't working properly. There are software loopbacks (which loops the functionality) and hardware loopbacks (which are intrusive, but more effective in isolating problems). Cisco has an excellent article on Loopback Tests for T1/56K Lines which covers hardware and software loopbacks. What is the difference between RJ-48 and RJ-45? * RJ-48 has a keyed connector and a notched jack. * RJ-45 does not have a key or a notch. 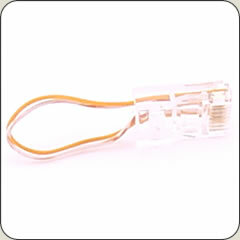 Although an RJ-45 connector will fit an RJ-48 jack, the key on an RJ-48 connector will prevent it from plugging into an RJ-45 jack. This connector has two wires. One wire loops from pin 1 to pin 4 and the other loops from pin 2 to pin 5. This is used to test a T1 connection. You can use it to replace either end of the cable that goes from the smart jack to the WIC card or CSU/DSU. This is to test a T-1 connection. This connector also has two wires. One wire loops from pin 1 to pin 7 and the other loops from pin 2 to pin 8. This is used to test a 56K connection. Since this is the only RJ-11 plug in the bunch, it should be pretty obvious as to when this should be used. The RJ-11 plug is the same type of plug that is used for your telephone line. Once again, I couldn't find any information on its usage with a quick search. My best guess here is that it's used to test both ends of a modem connection (POTS). This will also have to be left for a future post. I can't even find a good pinout diagram or any mention of the proper pinout for this loopback plug. From visual inspection, it uses one wire to loop from pin 3 to pin 4. This loopback plug uses the familiar RJ-45 jack. This loopback also uses two wires. One wire connects pin 1 to pin 3 and the other wire connects pin 2 to pin 6. [These four pins should be familiar - they are the four 'slots' involved in a cross-connect cable.] This loopback connector is used to test Ethernet ports. Once again, I find that information on this topic is not readily found and will have to research this further.